Today I’ve decided that I wasn’t quite finished Tripping On Glassid, and would like to expand a little further on the controversies of Google Glass. Just to have a quick recap, the main issue with this technological advancement is whether or not the wearers of these glasses will, at times, infringe on people’s privacy. Another issue is whether or not the Glass-wearers will be safe, seeing as how basically having a computer on your face could potentially be somewhat distracting to some users. One restaurant in Seattle has already banned the glasses before they even hit shelves for people to purchase. Though a bar is typically a setting for people to be seen, take pictures and associate with strangers, Google Glass seems to have already overstepped their boundaries, in The 5 Point owner’s eyes, and are not welcome. Maybe that spokesperson is right. Didn’t we find cell phones to be a crazy idea? Now we make fun of the huge, brick-sized cell phones a.k.a. 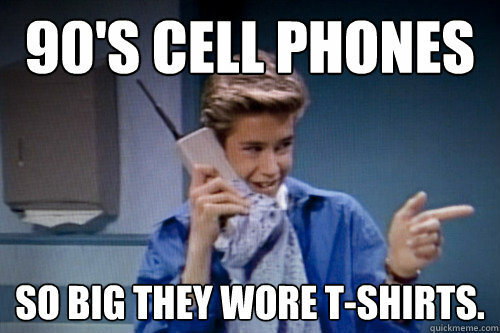 the Zack Morris phone. When they added cameras and integrated video into those mobile devices, weren’t we a tad skeptical? The answer to both of these questions is YES! Though with some time and tinkering with the new gadgets, we’ve grown to love them and accept them as the complete norm. With society as a whole, I feel as if we rarely put them down. They basically have evolved to be part of our hands now–not really, but you catch my drift. So will this happen with Glass? Will we get used to it or will the fad die out after a few months? Nobody can find out until the specs are finally released, but honestly I’m not sure if many people will have the funds to purchase them anyways. Though some of these seem pretty obvious, people may never think to take them off and may record the wrong thing at the wrong time. There is a strong possibility for more places to be added to the ban list in the near future, and I’m sure there will be plenty.